While an engineered wetland approach is in itself innovative for dissolved sulphide wastewater treatment, providing a sustainable, low maintenance solution offers an additional environmental benefit. An engineered wetland enhances the existing environment by providing additional habitat for aquatic life while reducing dissolved sulphides concentrations. This remedial approach uses multiple biological and physical processes (phytoremediation, pH neutralization, aeration and tidal flushing) to reduce the sulphides concentrations. 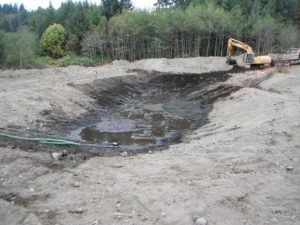 This solution is innovative in that it combines an engineered wetland with the sustainable approach of salvaging native species in the area of construction, removal and destruction of on-Site invasive plant species and the creation of enhanced wildlife/aquatic habitat in this ecologically sensitive estuarine region of BC. During construction, salvaging and re-planting of existing vegetation is conducted under a sustainable management approach for the construction of the wetlands to promote natural re-growth and bio-filtration. Utilizing natural sources encourages active bio-generation, enhances amphibian and aquatic habitat and provides a no maintenance natural filtration system. Vegetation and invasive species are removed to accommodate wetland construction. Topsoil and sub-grade materials are also removed and stockpiled for use as base material within the engineered wetland. Keystone Environmental agreed to assist in the completion of remediation and delivery of a Certificate of Compliance of the property – a former logging facility. The engineered wetland was part of the closure strategy, opening the opportunity for the purchaser to create park lands. The property had a spillway that was associated with a former hydroelectric generating station. Investigations found that leachates generated by the landfill were discharging to the spillway which in turn discharged to the nearby river. Both the spillway and the river are estuarine in these reaches and are influenced by tidal cycles. Keystone Environmental’s engineering and biological design considered necessary residence time of leachate in the wetlands to facilitate treatment by phytoremediation, pH reduction, aeration and tidal flushing. The area available for construction of an engineered wetland was a narrow strip located between the spillway and a treed area adjacent to the landfill. To provide the surface area and hydraulic residence time necessary for treatment, two wetlands were designed, interconnected by piping to intercept and treat the sulphide leachate. The design process included a biophysical assessment to characterize native vegetation and habitat types present at the Site, and to confirm the Site’s suitability for a constructed wetland. The area in the immediate vicinity of the spillway was the primary focus of the biophysical assessment. The spillway was characterized as a tidally influenced, brackish (water salinity ranged from 0.5 – 2 %) wetland ecosystem supporting a range of flora and fauna, particularly avian species. The dominant species identified were Lyngby’s sedge (Carex lyngbyei) and tufted hairgrass (Deschampsia cespitosa). These plants were selected for salvage and replanting during construction of the wetlands. Lyngby’s sedge is typically found in salt marshes, estuaries, and wet saline meadows, and was the dominant plant species in the emergent zone, from the low to high watermark. Based on the biophysical assessment, salvaging of existing estuarine vegetation that is salt-tolerant, including the Lyngby’s sedge and tufted hairgrass was key to the engineering design. The vegetation salvage and planting was undertaken once the engineering construction of the wetlands was complete. 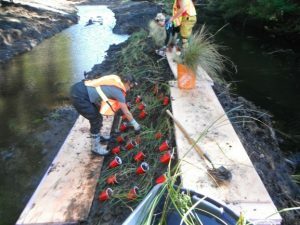 Approximately 2700 salvaged plants were utilized for re-planting in the engineered wetland at an approximate ratio of 90% Lyngby’s sedge to 10% tufted hair grass. Plants were transported manually to the wetland site and laid out for planting on a predetermined grid based on salt tolerance. A Certificate of Compliance was issued for this Site after the wetlands were installed, and a property transfer was able to be completed. This project demonstrates a regard for the future land use as the property is now owned by the municipality, and has been transformed into park land. Water quality monitoring following construction of the engineered wetlands confirmed that the concentration of dissolved sulphide (as H2S) in the wetland discharge was less than the reported detection limits and the British Columbia Water Quality Guidelines (BCWQG) during wet and dry season sampling. This engineered wetland remedial approach provides a sustainable, low maintenance, passive treatment system. By enhancing the natural environment by removing invasive species and re-using native plant species, the concentration of dissolved sulphides decreased in addition to creating supplementary habitat for aquatic life.